As more and more people flock to city centres, the square footages of urban homes and condos continue to shrink while the prices rise. Many urbanites are looking for a comfortable space to call home in the midst of a downtown buzz. As a designer, I was tasked with a challenge of creating a spacious oasis of an ensuite bathroom in a small and confined room. HOW TO CREATE A FEELING OF A LUXURIOUSLY SPACIOUS ENSUITE IN A SMALL FOOTPRINT OF A SPACE? 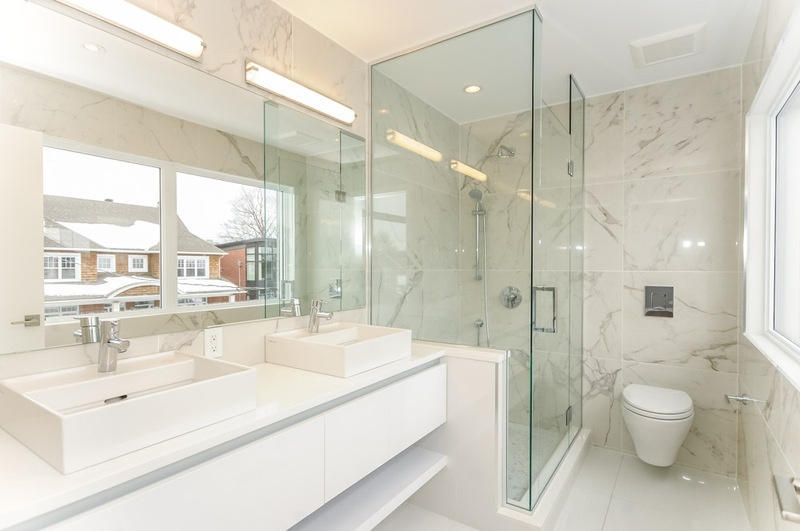 When possible, allow for natural light in the bathroom. There is something very decadent about having large windows and/or skylight letting the sunshine into the ensuite. When attempting to maximize the perceived size of a room, going with a lighter and brighter palette will help to create an illusion of spaciousness. 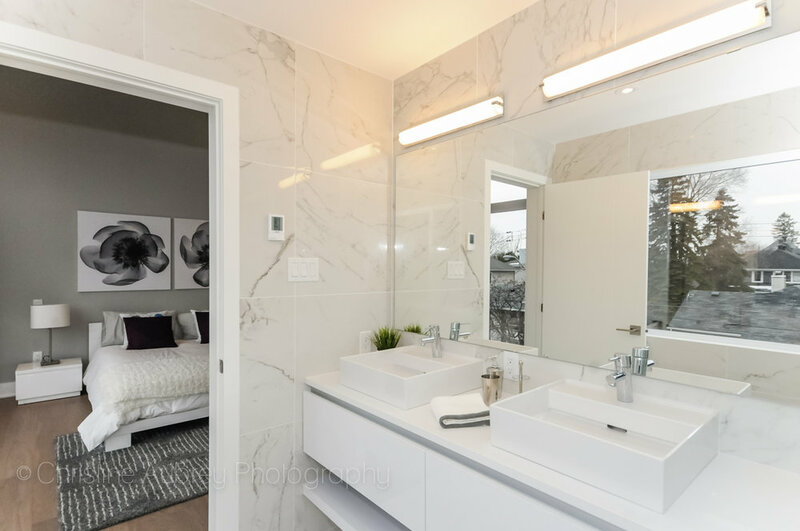 A combination of white floor tile, white marble wall tile, white vanity, counters and ceiling help to keep this small space feeling larger and more open than it is. Getting the vanity a foot or so off the floor is a great trick; however, providing a sufficient amount of storage is an equally important consideration. Be sure to consider both before arriving at a solution that is as practical as it is aesthetically beautiful. Frameless glass shower allows the light to travel straight through without interruption, creating a visually open layout. Large mirror, like large windows, does wonders to open up the space. While black, brass and a multitude of other finishes are trending on the market, chrome continues to be a simple and clean option - this was my choice in this case to keep this space looking open and streamlined. Wall mount toilet can save up to 10 inches by moving the tank into the wall. The toilet sits off of the floor taking up less room visually and allows for easier cleaning. There are many minimalist clean designs available, though they are typically more expensive than the standard option. I went with gloss options for some of the finishes and fixtures. Gloss surfaces contribute to the feeling of openness. That being said, I find that mixing in some matte finishes can create a more interesting and balanced look. I worked with a lot of horizontal lines in the vanity, basins, mirror and light fixtures to streamline, simplify and open up the space. Further, I opted out of using cabinet hardware, instead going with a clean and simple contemporary look. While going for a more contemporary and minimalist aesthetic, it is important not to overlook the quality of the details. “Less is more” is my design mantra - I tend to always choose quality over quantity when it comes to design details. One example here are the sleek Kartell by Laufen basins with concealed drains. The end result is proof that carefully thought out design decisions can help to create an oasis of calm and open respite even with space limitations of condo living.